What does driving mean to you? If you can’t answer that question you probably don’t belong here. As an enthusiast, we can answer that question, but we know it’s a trick because there’s no single answer to it. Each of us can only say what we feel when it comes to the solution of that question. Some may want their car to be on steroids, nursing a bottle of nitrous-oxide and more juiced up than the Russian Olympic Team, and others love a car that breaks everyday, (I swear that’s not what FORD stands for). At the end of the day, we all need a hit, because driving is our passion. Consuming this hit; now, this is where the passion starts, some of us are like addicts, and just like in a world of addictions, there’s the high functioning addicts, those who make it into an art-form. The real connoisseurs, make it sure it’s the purest, the cleanest and of course make sure it doesn’t interfere with other aspects of your life. Work Hard, Play Hard. Duane’s EG hatch, is his passion. He’s a real connoisseur. It’s been a little while since we left off with his project car. It’s driving now and I had the pleasure of heading out for a shoot with him. This is his rendition of Honda’s EG hatch. He’s built his Honda around what he loves to do, and that’s drive. Duane’s has still been dialing this car in, it takes a while because its a process, but so far he has had no regrets with the build. Project cars are never really finished to be honest. 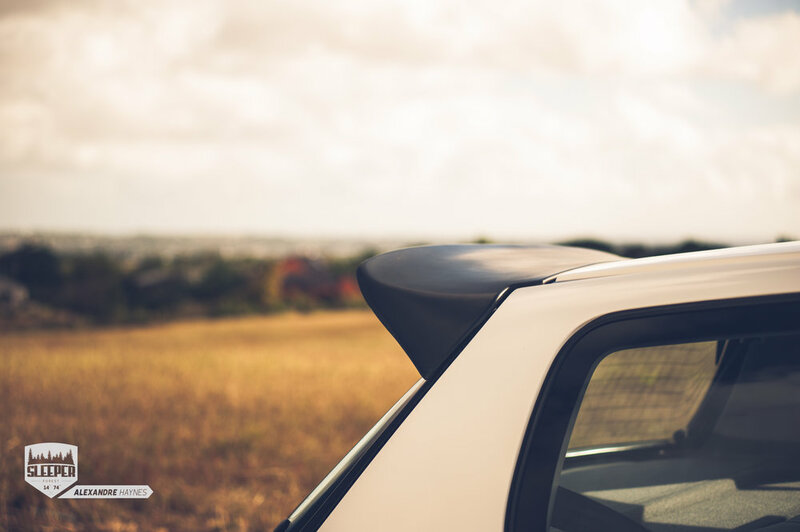 His car is a weekend warrior, it usually sits in the garage, till the weather is good, and the mood is right, when you can drive and just escape the stress of the week, or simply to enjoy the hard work put into building the car. 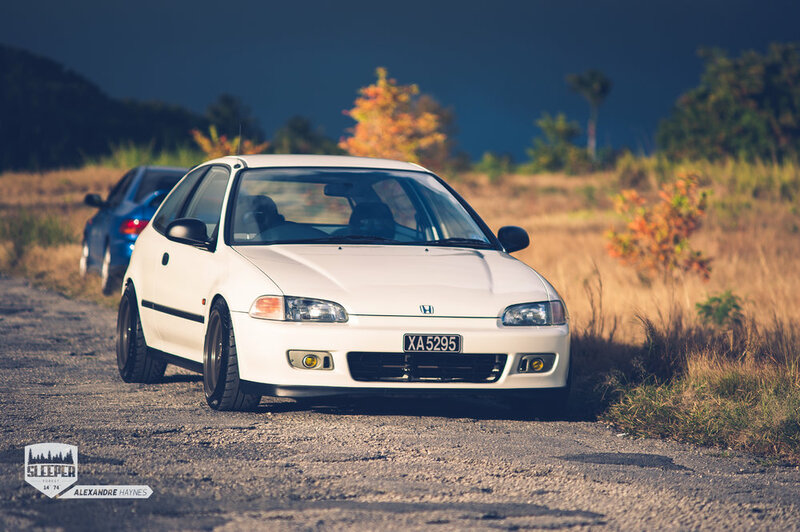 Honda maybe the most iconic Japanese Domestic Market (JDM) brands on the planet. 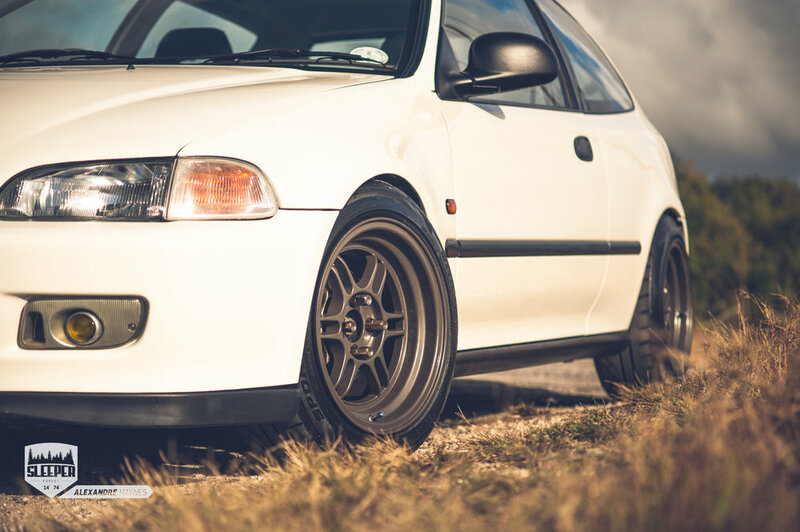 This is something we’ve definitely covered before though, usually when it comes to Honda, it’s a whole subculture behind those who modify them. Calling out of Osaka prefecture in Japan, the Honda community there has been seen as the home of JDM car culture, and especially Honda’s subculture birthplace. It may be shocking but, most of the JDM culture we see today, is really a bastardized version of what this influence really meant. Duane’s car screams 90’s JDM overtures. His RPF1s aren’t cambered out of usefulness, and his modest Osaka JDM rear wing politely fixes the OEM solution. These rims are extremely light, it helps save weight, and obviously, fitment is everything when it comes to filing the wheel arch, these are quite pleasing. The wider tire definitely gives way more grip. The inside is where the magic happens though. He’s very carefully, kept the interior pristine, its the OEM Honda EG hatch set up, just sporting a few gauges and a MOMO wheel. His AEM wide-band looks like it came out of Honda factory like that. I love the way everything really feels like a 90’s era project. His car was actually an automatic before the swap, but he’s kept the standard dash cluster for now, with the idea of switching it to the cluster from an S2000. In my opinion small things like that, makes the car a bit more interesting, it tells it’s story really. A basic set up is far more driver oriented. 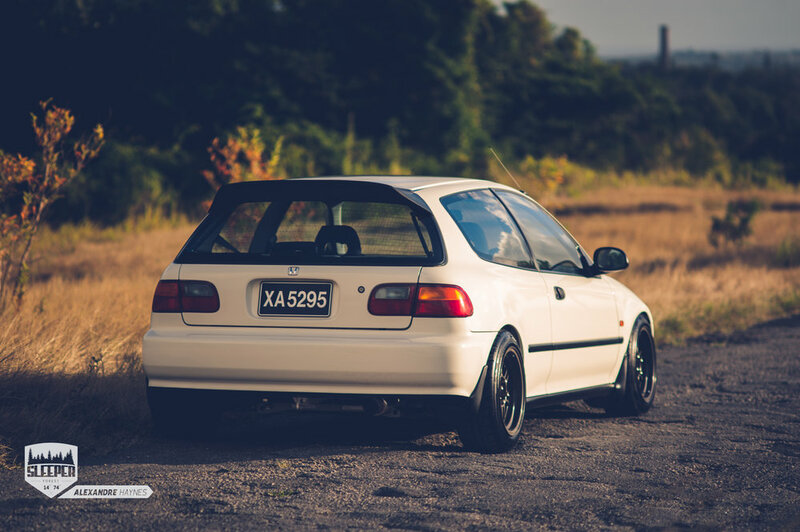 Duane’s Honda, is by no means a Russian Olympian, it’s not juiced up, but it offers a particular driving experience that was craved for back in the era of the 90’s. 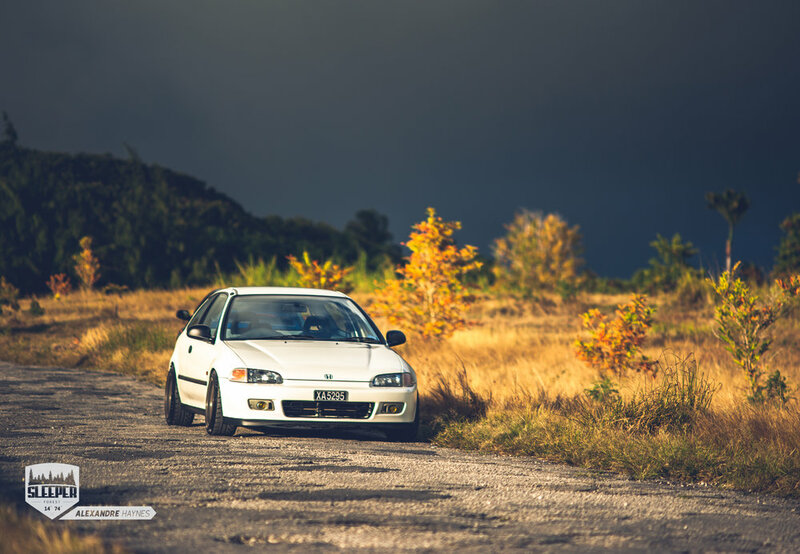 He’s swapped the factory D series for in favor of the Integra Type R’s B18C. Technically, this makes his EG Hatch a Type R Honda? I’m probably starting a huge fire by saying that. Swapping the Engine was really easy, but he took on the extra task, of adding air conditioning to the car, and in Barbados, it really is worth it. A few weeks of planning and fabrication and adaptation of some pipes and hoses and he was was well on his way to luxury. The B18C in this car, makes around 180hp, which means he gets about 150 hp to the wheels. It’s a modest amount, but it does the job on this ultra light chassis. It’s really around the perfect performance to weight for a fun B road killer. Where would you say is the perfect road in Barbados? Our roads usually spark debate, but don’t forget that we have some of the best tarmac rally stages in the Caribbean. When we talk about B Roads though, we mean those that are out of the way, not really connected to the highways, somewhere in the back country. Barbados may have one of the most dense road networks in the world. On the upside of this, it means some roads maybe grow into obsolescence not by choice but simple pragmatism. Leaving them pretty lonely and pretty important for a weekend warrior. So instead of taking that left, you usually take when you know the road, how about you take the right and find out where that road leads you, because some of the best roads maybe sitting under your nose. A good weekend bash, coming to an end, it’s always a good time to check in on the family, and see how they are faring, because we know the week is ahead, it’s a shame weekends don’t last forever. Maybe the fact we don’t always have the chance to drive for the sake of it, makes the ritual a lot more mystic. I’m extremely pumped to have had the chance to shoot this JDM gem. It’s a new year with Sleeper Forest, and there’s so much to look forward to this year! New opportunities and new projects always bring new and exciting content to the website. This is Alex and I’m signing off for now, happy motoring everyone! Follow Sleeper Forest on Social Media!